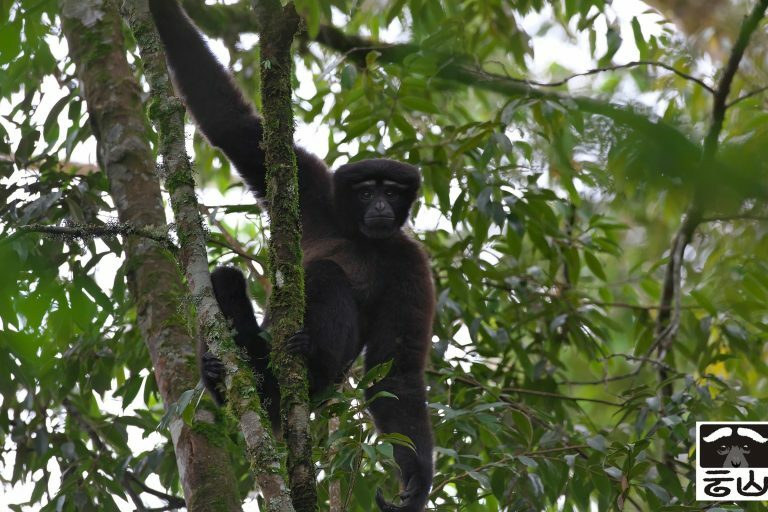 Carolyn Thompson, a Ph.D. student at University College London, is studying the newly described and little-known Skywalker hoolock gibbon. She is working with the very team that first described the small ape in the China-Myanmar border region. Thompson hopes that her research will contribute to the gibbon’s threat assessment on the International Union of Conservation for Nature Species Red List. 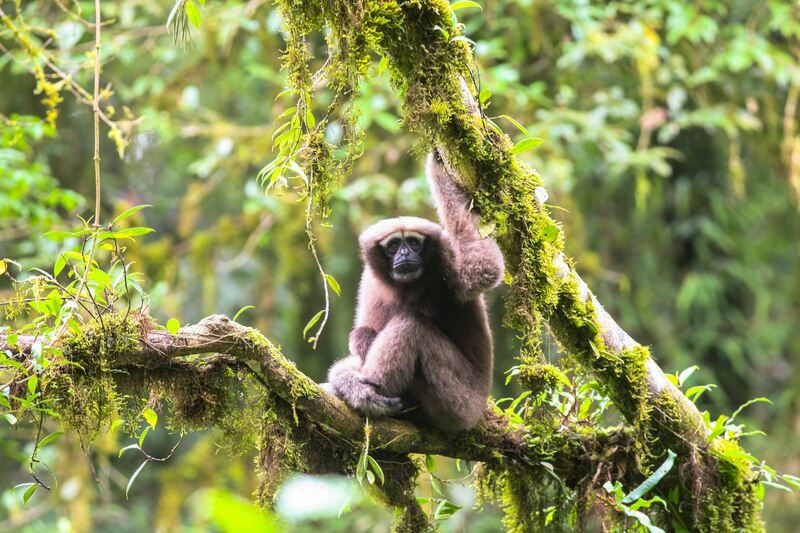 In January this year, scientists described a new species of ape – a white-browed gibbon that lives in the remote forests of the Gaoligong Mountains on the border of China and Myanmar. The gibbon was originally classified as the eastern hoolock gibbon (Hoolock leuconedys). But the lead researcher, Fan Peng-Fei of Sun Yat-sen University in China, noticed that the gibbons of the Gaoligong Mountains seemed different: they had different markings on their bodies and their calls were unusual. So the team studied the gibbon in detail and confirmed that the primate was indeed a new species, previously unknown to science. The researchers, who are big Star Wars fans, named it the Skywalker hoolock gibbon (Hoolock tianxing) after Luke Skywalker. Adult male Skywalker hoolock gibbon, China. Photo by Fan Peng-Fei. The newly described Skywalker hoolock gibbon is a mystery. Scientists are unsure of its population size, or what threatens its survival in the wild. 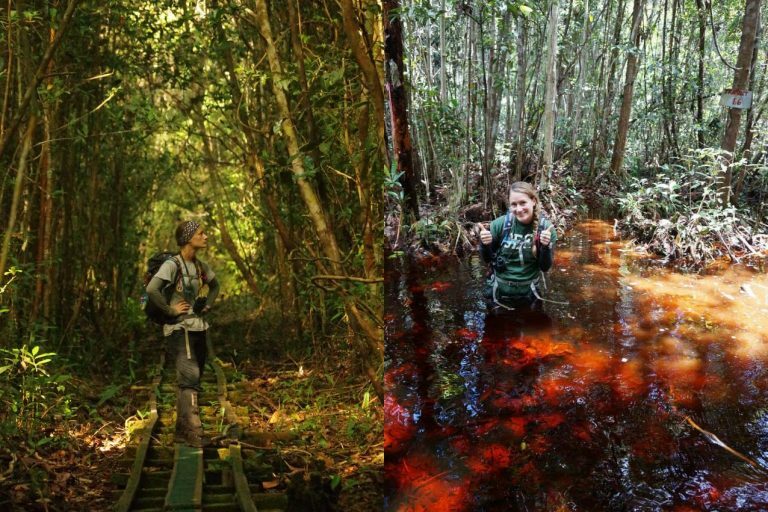 Carolyn Thompson, a primatologist and doctoral student at University College London, is trying to fill these gaps. Thompson has spent nearly a decade studying primates. She worked as the head primate scientist at the Borneo Nature Foundation in Kalimantan, Indonesia, where she studied primates like the Bornean white-bearded gibbon. 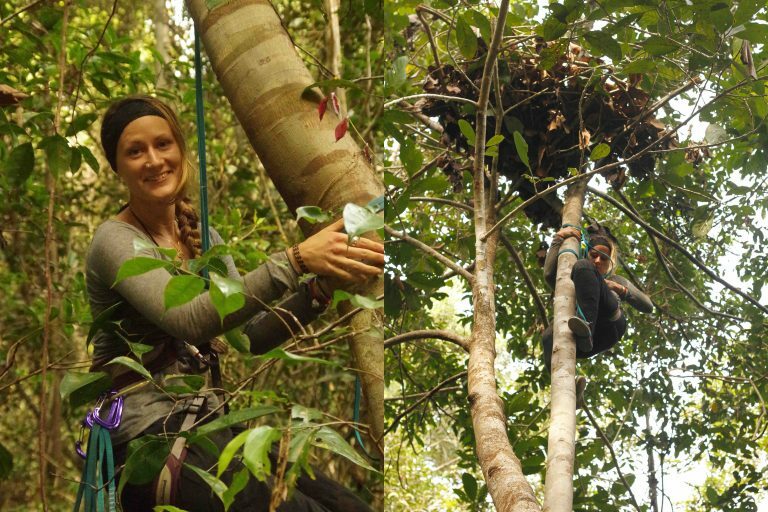 “It was there that I fell in love with our singing, swinging cousins, the gibbons,” she told Mongabay. Now, Thompson is doing her doctoral studies with the very team that described the Skywalker hoolock gibbon. This is her dream Ph.D., Thompson says, but finding the funds to cover her research costs has been tough. Currently, she teaches part-time to support her research. She has also launched a crowdfunding campaign to help pay for some of her work. To celebrate International Gibbon Day on Oct. 24, Mongabay interviewed Carolyn Thompson about her work on the newly described Skywalker Hoolock gibbon. 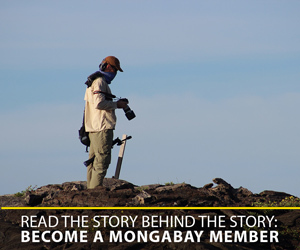 Mongabay: How did you become interested in wildlife? What is your background? Carolyn Thompson: I was very fortunate and had an amazing childhood growing up in Scotland, Indonesia and Norway. I was always surrounded by mountains, rainforests and had plenty of opportunities to spot wildlife. At the age of 7 I already knew I wanted to work with animals. My first non-human primate encounter was in Indonesia. I was 3 when my mum took my sister and I to a monkey park with long-tailed macaque residents. I saw one grimace and shouted excitedly, “Mum, that monkey is smiling at me!” (I now know that it was not smiling. It was most likely a threat display!) At school I focused on geography, biology and psychology … and later studied towards bachelor degrees in geography and life sciences. This eventually led to a master’s of research in primatology. Why did you decide to focus on primates? Primates have always fascinated me: their unique behaviors, their adaptable nature and their interesting evolutionary lineage. I always wanted to focus my career on a species that really needed conservation attention, however. When I was in my teens I read an article all about the palm oil industry and the devastation it was causing. It quickly became my dream to get out to Borneo to see the situation for myself and help the orangutans in any way I could. I started out working hands-on with primates in sanctuaries, but I soon realized the importance of conservation research, after which I became very passionate about studying wild primates in situ. You’ve had 10 years of experience working in the field of primatology. What has been your favorite project? During and after my university studies I tried to get as much field experience as possible. After all, primatology can be a competitive field. As a result, I have worked in some wonderful, awe-inspiring places with some amazing organizations – some bad ones too! I have many fieldwork stories involving black mamba and pit-viper bites, primates defecating on my head, and skinks living in my bed! One of my favorite organizations was the Borneo Nature Foundation based in Kalimantan, Indonesia. I worked as the head primate scientist in a peat swamp forest managing three research projects, one of which was on the Bornean white-bearded gibbon. It was there that I fell in love with our singing, swinging cousins, the gibbons. 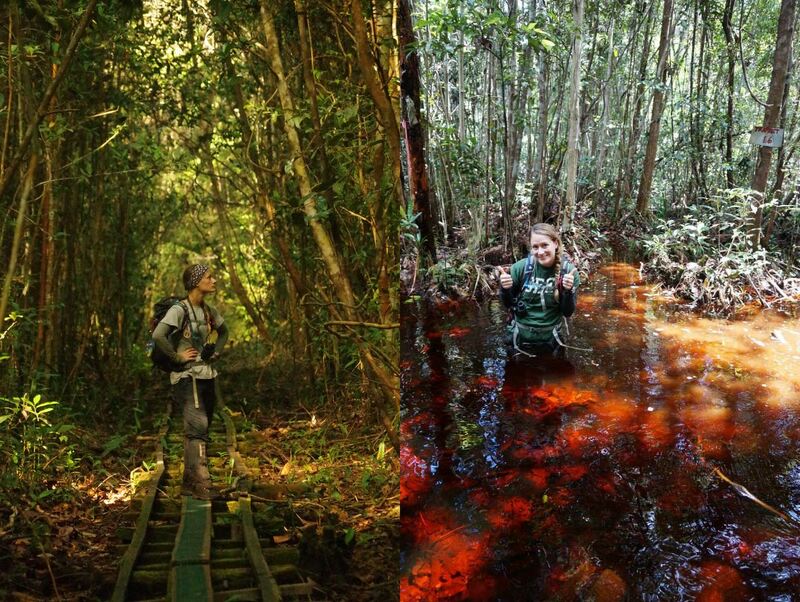 Carolyn Thompson in the forest (left) and in a peat swamp forest (right), Indonesia. Photos by Helene Birot (L) and Carolyn Thompson (R). Why did you decide to study the Skywalker hoolock gibbon? The majority of the 20 known gibbon species are endangered. The Hainan gibbon, for example, is the world’s rarest mammal, with less than 30 individuals remaining. Not many people know about gibbons, the smallest of the apes. In comparison to their great ape cousins, they are often overshadowed, so it’s great to have an International Gibbon Day to raise some needed awareness! When reading articles about endangered gibbons, I knew this was the area I wanted to focus my career on. Earlier this year, a new species of gibbon, the Skywalker hoolock, was discovered on the border between China and Myanmar (Burma). Population surveys have revealed that there are only 200 individuals in China but numbers in Myanmar are currently unknown. We still have lots to learn about this new species, which presents a very exciting research opportunity, but we are also under time constraints as the Skywalker gibbon is threatened by hunting and habitat loss. What do you hope to study and find out during your Ph.D. studies? My main aim [in] my research is to investigate the patterns and drivers of gibbon decline in eastern and southeastern Asia. I am very interested in transboundary populations (that is, those species that are found straddling the border of two or more countries). Studying such species presents vital opportunities for international communication, cooperation and collaboration. I plan to focus on the Skywalker gibbon, carrying out important population density surveys in Myanmar and analyzing DNA samples to investigate patterns of dispersal and potential inbreeding. This information will contribute to the species’ threat assessment on the International Union of Conservation for Nature Species Red List. I also plan to work very closely with local communities to understand values, needs and patterns of resource use. Do you spend much time in the field? If so, what does a typical day in the field involve? I love fieldwork. It is one of the best parts of my job! For my Ph.D. research, I will have to spend more than one year in the field. Depending on the species, a typical day usually involves waking up whilst it’s still dark and trekking into the forest. I then sit and wait for the gibbons to start their singing. Gibbons have these haunting, species-specific, territorial songs – the most magical thing you will ever hear! I then use the songs to target certain groups or to collect population data. If following a targeted group, I quietly approach the family and wait for the sun to come up so I can try and spot my focal gibbon, the one that I will be collecting data on. I am a behavioral ecologist, so the majority of my experience has involved recording activity budget data for activities like travel, feed, rest and social interactions. I will follow a family group until they find a sleeping tree to rest in for the night. The days can be long but so incredibly rewarding, and there are always unexpected delights in the forest. I’ve found unusual invertebrates, accidentally tripped over a wild sun bear, and once saw 13 unexpected wild orangutans in one day! 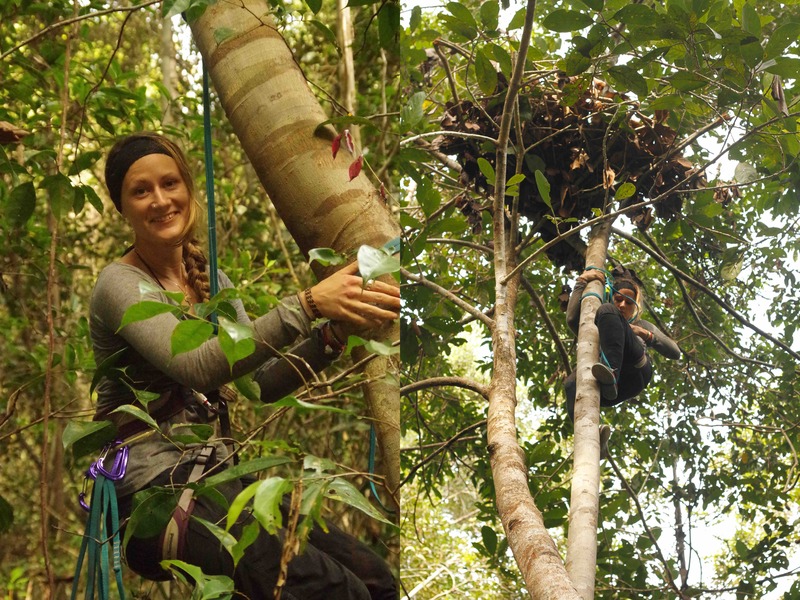 Carolyn Thompson climbing into an orangutan nest in Indonesia. Photos by Bernat Ripoll Capilla. You mentioned that you struggled to find funding for the Ph.D. of your choice. Can you tell us about that? In 2015, I started planning this Ph.D. project with my supervisors. Although I have 10 years’ worth of experience in this field working with reputable organizations and a handful of strong qualifications including an MRes in primatology with distinction, securing funds in [primate] conservation is extremely difficult. I’ve watched many of my colleagues slowly give up on working in primatology due to the lack of opportunities and funding in this field. I refuse to give up, however. I knew I would not be happy doing anything else and had to stay true to myself. I accepted all the rejections and prayed for that one “yes” that I needed. I applied to a handful of organizations for competitive grants but was sadly unsuccessful. From my experience, it is much easier to apply on behalf of an organization, rather than as an individual like myself, who is just embarking on their Ph.D. journey. I even tried applying to a doctoral training school. I was halfway through my interview excitedly telling the panel all about my intended research and potential methods and outputs, when they asked me what else I was interested in. This question threw me. I had not fully understood the nature of the doctoral training program until that moment. I was told I was unsuccessful because I was “too focused for that Ph.D. program”. I was so unbelievably disappointed. I was also confused – surely one should be focused when conducting Ph.D. research? My supervisors have been amazingly supportive. They have taken me on as a self-funded student. I teach part-time, without which I wouldn’t be able to do my dream Ph.D. and this important research. It is tough trying to focus on my Ph.D. when my days are taken up with teaching commitments. A friend therefore suggested I look into crowdfunding. I will admit I am not tech savvy so the prospect daunted me. I have thrown myself into it, however, and have set up a campaign to ask for financial support to help cover some of my research costs. It has been a learning curve and I am so thankful to all those generous friends and family who have helped me get this campaign off the ground. In particular, Dave McCall, [who] is a professional animator and has devoted hours of his time, working free of charge to create a wonderful masterpiece showcasing my research. You can support my campaign at www.gofundme.com/skywalkergibbonresearch. 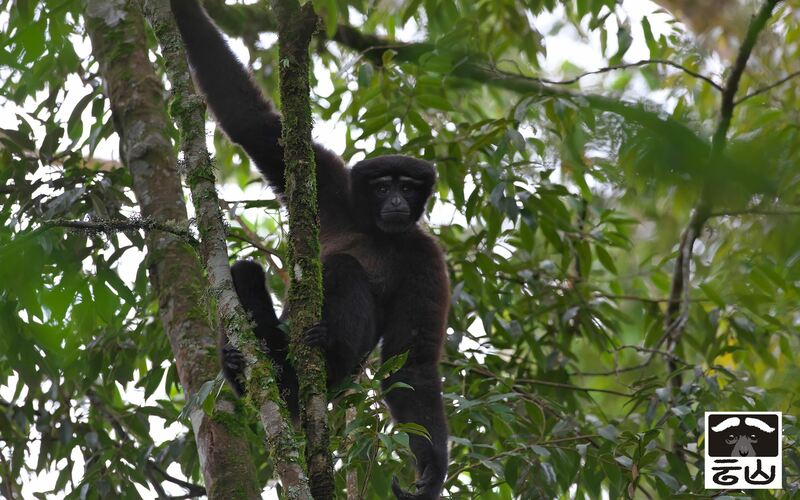 Adult female Skywalker hoolock gibbon, China. Photo by Fan Peng-Fei. What’s it like working with the very scientists who discovered the Skywalker gibbons? It is so incredible! Minus the fact that I have limited financial support, I am doing my dream Ph.D. with a gibbon dream team! My supervisors work at University College London, Zoological Society of London, and Sun Yat-sen University in China. They are all so knowledgeable and each scientist brings something different to the project. They are all incredibly approachable and forthcoming with their ideas and suggestions. I owe them so much thanks for realizing my passion for this topic and taking me on, no questions asked. What excites you the most about Skywalker gibbons? Have you seen one in the wild? I am yet to see one in the wild. I am hoping with the crowdfunding support, I can get out into the field early next year. I am so unbelievably excited and keep pinching myself. It is every zoologist’s dream to work with a newly discovered species, especially one with such an amazing name. I am a massive Star Wars fan so I’ve decided it’s fate. Any advice for people wanting to study primates? Never. Give. Up. You may get plenty of rejections, but if you are passionate, enthusiastic and determined, your hard work will pay off and be noticed by someone. You also don’t need to follow the usual route. I did an Open University degree very early on in my career so that I could work part-time and earn money to pay for fieldwork opportunities. It was one of the best decisions I ever made. Volunteering experience is so useful on your CV – but do your homework. There are a lot of organizations that ask for a great deal of money and offer little in return. Finally, you should read widely around primatology to get a feel for the different research being done. Don’t be afraid to email academics to introduce yourself and present your ideas. It is so important to network and build up contacts.